RuneScape is the Old Faithful of MMORPGs. It’s been here longer than most of them and will probably be around after the rest have gone. It updates regularly and frequently, over 900 times since its launch in 2001. Today’s update, however, is something more: It’s a full-blown expansion, the first in RuneScape’s 16-year history. Menaphos is both the name of the expansion and the lush and vibrant desert city that players will be exploring. Menaphos, or at least its outer walls and gate, has actually been in the game for a dozen years. Impenetrable and mysterious, its doors are now flung open, inviting in heroes and rogues alike. The players will likely be a bit of both, as they seek to enrich themselves at the expense of the avaricious pharoah of the gilded city. “Go big and go colorful” is the motto for Menaphos. It certainly qualifies as both, and looks pretty good for such an old game. It’s still low-tech enough to play in a browser, which a solid percentage of RuneScape’s players still do. Over 250 million players have created an account for the game, which has brought in $750 million since its launch, and it’s still getting bigger, growing more than 25% year-over-year. 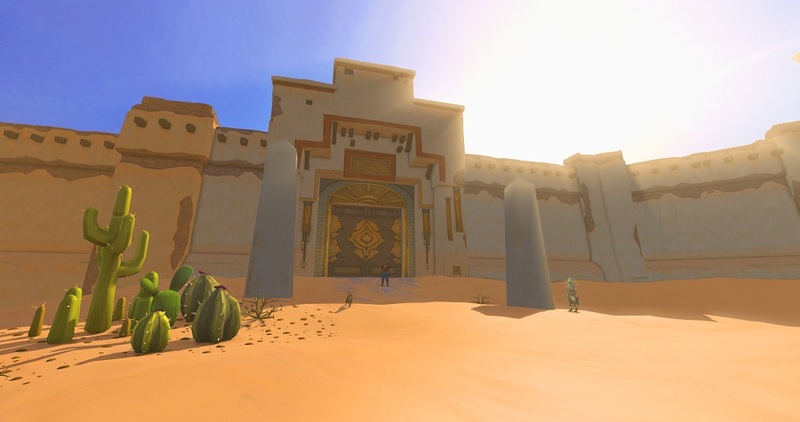 The main piece of repeatable content – because every expansion needs some – is the Shifting Tombs, a procedurally generated dungeon meant to represent the various unexplored catacombs beneath Menaphos. Players will have five minutes to scour the area for the pharoah’s treasure, using all the skills at their disposal, including the Slayer skill, which is now capped at 120. It’s not just about combat; traps will need to be avoided or defused, and you’ll need to find the exit before time expires to make off with your ill-gotten goods. That increased Slayer skill also comes into play in the Slayer dungeon, found beneath the adjoining (and cleverly named) City of the Dead, Sophanem. Even the gods themselves will challenge you in Menaphos. Crondis, the crocodilian goddess of pleasure, resides in a sumptuous palace where she demands that all earthly goods be brought to her. She’s just one of the many colorful characters you’ll cross paths with in Menaphos. At the end of the road, players will challenge the greedy pharoah himself in an epic boss battle. Naturally, his guards must be overcome first; once they’re dealt with, the pharoah enters the fray himself, putting out pools of green goop that get tougher to avoid as they fill the plaza square where the battle takes place. We spent the rest of our press tour getting a guided tour of the city, which looks remarkably good for such an old game. No, it doesn’t have top-of-the-line graphics, but it’s also not embarrassingly bad to look at either. Heck, I’d almost argue that it’s aged better than World of Warcraft. “We’re a game that’s 16 years old, so modernization is huge,” Osborne said. “We dedicate almost half of our development team to the modernization of the game.” The game added an achievement system in the past month, offering “paths through the content and short-term objectives, so you don’t feel so lost.” MMO achievements in 2017? Whoa now, don’t get too modern! Menaphos and Sophanem combined are, as advertised, big and colorful. Osborne zoomed out to show us the world map, and the two cities take up a decent chunk of the Kharidian Desert. Zooming in, we cruised across the desert on our flying carpet before finally legging it in the city itself. The streets are alive and bustling with NPC activity and will surely seem even more crowded once the gates are thrown open to players. If grand adventuring isn’t your thing, or you just want a break from the Shifting Tombs or other content, you can find NPCs who will give you short quests, more like other MMO quests and less like hours-long RuneScape quest lines. 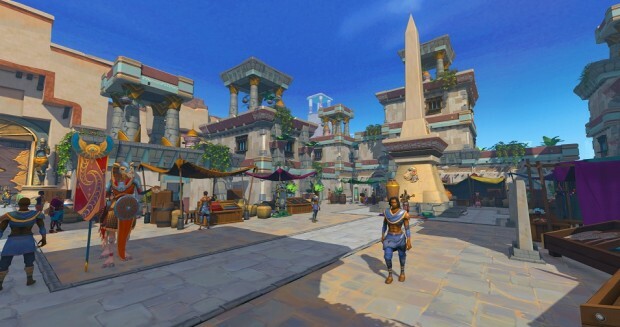 These quests are random and dynamically generated – sometimes a merchant needs something and sometimes he doesn’t – so Menaphos will always offer something different each time you visit. Speaking of something different, my favorite part of the city was the Grand Library, a gorgeous repository of knowledge in the heart of city. Set amid tranquil pools of water, its shelves overflow with scrolls, and they aren’t just for decoration. Jagex asked players to submit stories that could be included in the library. Osborne and his team sifted through the 500 or so stories they received and narrowed it down – after “a lot of reading work” – to around 30 stories for inclusion in today’s launch. “The quality was sky-high, largely because our players have been with the game so long and they know the source material inside out,” so more will be added in the future. It’s a great way for Jagex to involve players in the development of the game and to give them a chance to see their efforts added to the game’s lore. 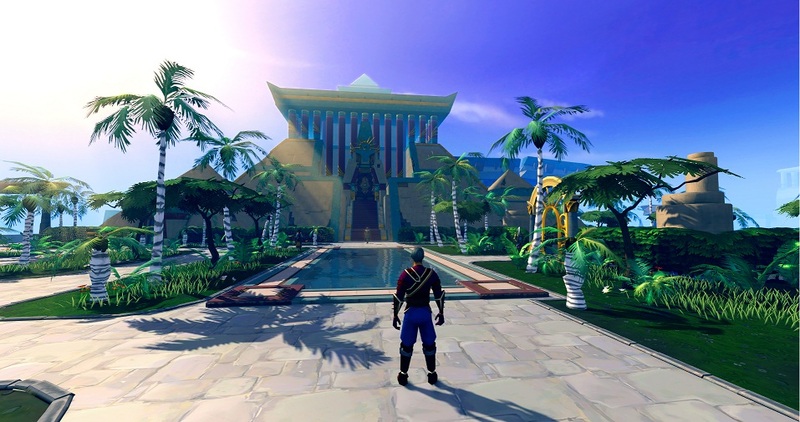 If you’ve always wanted to try RuneScape but never got around to it, now’s the perfect time. 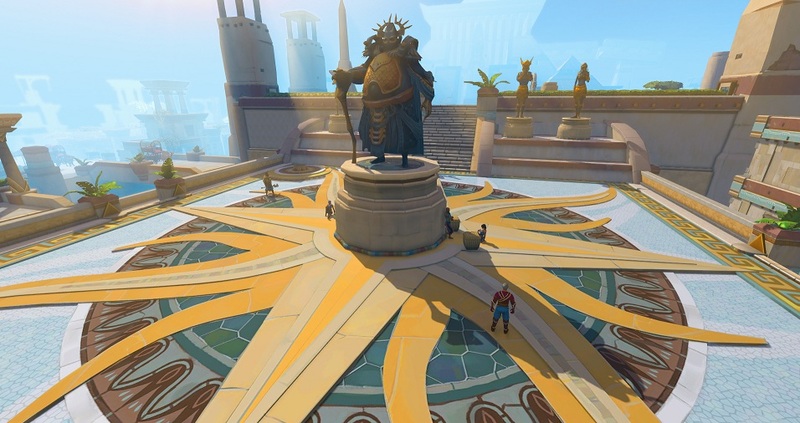 Menaphos adds more to the game than any other content update to date. It looks to be a showcase of everything RuneScape can be, from solo content to groups, from random adventures to scripted encounters. It still has low system requirements and can be played in a browser, so even if you’re running a potato, you can get into the action. Following the Star Wars: The Old Republic convention, the expansion is only available to RuneScape members, though membership is cheaper than with most other MMOs: $9.49/month for just a single month, discounted all the way down to $7.50/month if you subscribe for 12 months. To celebrate Menaphos’ launch, there’s also a summer sale going on, offering a three-month membership bundle for $18.99, or $6.33/month. And if you really aren’t sure you want to commit the cash just yet, you can enjoy Menaphos for free this weekend, from June 9-12. Thanks to the Jagex crew for taking the time to show us Menaphos! The golden city awaits!